To reserve from a finite and perishable inventory, we must request payment upon receipt of orders. We accept Visa, Master Card, American Express, Discover cards and PayPal. We ship year round, though some plants are subject to seasonal availability. We do book orders and reserve plants in advance of availability. We do not ship to Alaska, Hawaii, outside the U.S. or to an APO/FPO address. Agricultural regulations restrict the shipment of certain plants to some states, primarily California. A $20 Handling Charge maybe added to some Western State orders due special handling requirements. Free standard shipping on all plant orders this week, no coupon code need. Subject to availability, we ship ASAP, but our "official policy" is: Unless a future ship date is requested, orders placed by 12:00 pm ET on Tuesday, are shipped by the following Monday or Tuesday, subject to Availability, weather and backlog. A projected availability may be noted if a plant is not currently available. Plant are placed into specialized boxes to ensure they are not crushed or toppled in shipping. Moisture level is checked to ensure plants will arrive in good condition. Your order may be shipped special priority USPS, UPS or FedEx Ground to ensure on time delivery and healthy plants. 72ct Flat - 2.5x1.3 inch cell plug tray. Bare root ("BR") perennials are one+ year plants or divisions of older plants - sold in "lots" or individually with minimum quantites. Hemerocallis and Hosta are 1-4 eye/fan divisions depending on the variety. Intersectional peonies are sold as divisions of a two year field clump. Many of the products we offer are grown in containers. Quantities in flat sizes including 10, 18, 20, 30, 36 and 72 (larger count / smaller plant sizes may be available, which are typically sold to professionals to be grown in containers). 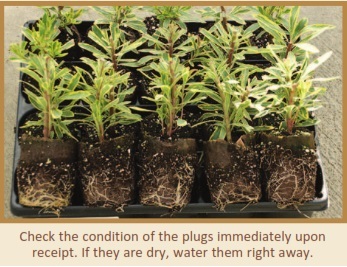 Some of our plugs are environmentally friendly Elle Plugs, while others are traditional plugs. Modes are determined according the specific needs of the plants and to reduce the shock of transplanting. 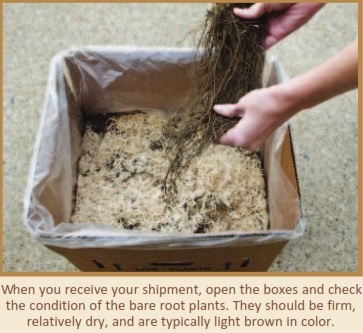 Due to summer heat or winter temperatures, we may not be able to ship some plants when requested. Western states are more limited and may entail preperation requirements / additional costs. Tracking information will be emailed upon shipping. Please provide (2) weeks notice for change or cancellation requests, otherwise restocking / replanting fees may apply. Nursery cannot be held responsible for delivery problems due to incorrect addresses, including return or redirect carrier's address correction charges and any additional shipping fee to reship the order. ** Did we mention Mother Nature may effect the shipping schedule?